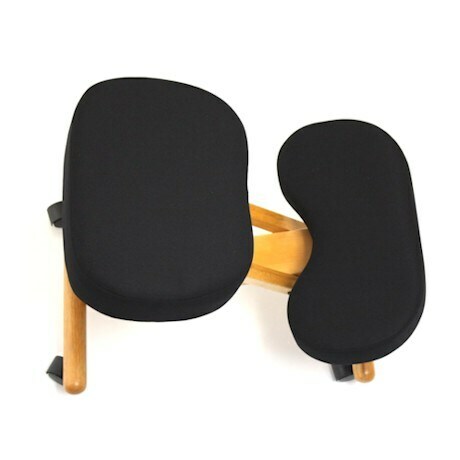 emory Foam Kneeling Chair Looks Beautiful, Helps Ease Pain The Jobri BetterPosture® Classic Plus Wooden Kneeling Chair has the same beautiful features and health benefits of the Classic Wooden Chair with the addition of BifomPad memory foam for all-day comfort that hugs and supports your body. Like all Jobri BetterPosture Kneeling Chairs, the Classic Plus Wooden Chair adjusts your posture forward to align your back, shoulders, and neck. 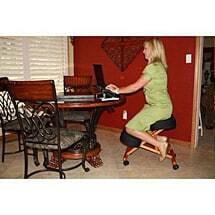 This helps ease discomfort and chronic pain while strengthening your back muscles. It features a steel-reinforced gumwood frame with additional wood layers under the cushions for support. The chair rolls smoothly on four nylon casters. The seat cushion measures 16? x 12? and the knee cushion measures 18? x 9.5?. Screw height adjustment from 25" to 29". Black 280 lb. weight limit. 5-year manufacturer's warranty on components. 2-year manufacturer's warranty on fabric.